Along with the other, more obvious, December holidays, this month we also celebrate Monkey Day! December 14th is the unofficial holiday reminding you to appreciate your fellow primates. Begun in 2000 by artist Casey Sorrow at Michigan State University, it has spread all over the world with celebrations occurring in zoos such as Lahore Zoo in Pakistan and the Tallinn Zoo in Estonia. A day for costume parties and meant to draw attention to medical research and animal rights, particularly for simians, take part in Monkey Day this year with the Bucknell Press! Here at the Press, we support Monkey Day this month with a showcase of our own monkey and ecology themed works: Monkey Farm by Donald Dewsbury expands on the history of Yerkes Laboratories of Primate Biology; Leaders in the Study of Animal Behavior edited by Donald Dewsbury relates the autobiographies of leading scientists in the animal behavior medium; and A History of Ecology and Environmentalism in Spanish American Literature by Scott M. Devries presents an ecocritical examination of the region’s literature. 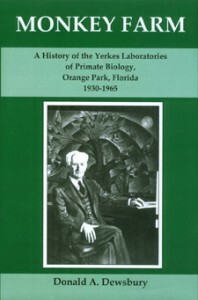 This book is a history of the Yerkes laboratories of Primate Biology. The facility was founded as the Laboratories of Comparative Psychobiology of Yale University by Robert M. Yerkes, one of the leading psychologists of the twentieth century. The Yerkes Laboratories became the largest and most important collection of chimpanzees for research in the world. During its thirty-five-year history it was home to some of the leading behavioral scientists of the time. The book is, in essence, a biography of an institution. Brought together in this volume are autobiographical chapters written by nineteen of the leaders in establishing the science of animal behavior as a vigorous discipline in the twentieth century. The diversity of the authors parallels the diversity of approaches in the field. The range includes representatives of core ethology, comparative psychology, and general zoology. There are both field and laboratory workers. Ten reside in Europe, nine in the United States. Two have won Nobel Prizes and one a Pulitzer Prize. The focus of each chapter is the life of the author as related to the discipline — these are scientific autobiographies. Important events are recounted and each author provides his perspective on the field. Contributors to this volume were selected by a panel of seven animal behaviorists, themselves representing different disciplines, who made an effort to select among the most prominent living senior workers in the field. The book should be an indispensable part of the history of the study of animal behavior — unique in bringing together first-hand accounts of the development of the field written by its leading, living practitioners. It should also be a guide for young students in making intellectual career decisions and seeking models and modes for important research and professional directions. Science is seen as being conducted by living, breathing human beings, with the same aspirations, doubts, and frailties as other human beings. 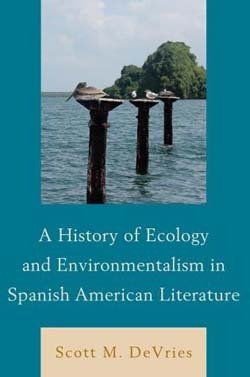 A History of Ecology and Environmentalism in Spanish American Literature undertakes a comprehensive ecocritical examination of the region’s literature from the foundational texts of the nineteenth century to the most recent fiction. The book begins with a consideration of the ways in which Argentine Domingo Faustino Sarmient’s views of nature through the lens of the categories of “civilization” and “barbarity” from Facundo (1845) are systematically challenged and revises in the rest of the century. Subsequently, my book develops the argument that a vital part of the cultural critique and aesthetic innovations of Spanish American modernismo involve an ecological challenge to deepening discourses of untamed development from Europe and the United States. In other chapters, many of the well-established titles of regional and indigenista literature are contrasted to counter-traditions within those genres that express aspects of environmental justice, “deep ecology,” the relational role of emotion in nature protectionism and conservationism, even the rights of non-human nature. Finally, the concluding chapters find that the articulation of ecological advocacy in recent fiction is both more explicit than what came before but also impacts the formal elements of literature in unique ways. Textual conventions such as language, imagery, focalization, narrative sequences, metafiction, satire, and parody represent innovations of form that proceed directly from the ethical advocacy of environmentalism. The book concludes with comments about what must follow as a result of the analysis including revisions of canon, the development of literary criticism from novel approaches such as critical animal studies, and the advent of a critical dialogue within the bounds of Spanish American environmentalist literature. A History of Ecology and Environmentalism in Spanish American Literature attempts to develop a sense of the way in which ecological ideas have developed over time in the literature, particularly in the way in which many Spanish American texts anticipate several of the ecological discourses that have recently become so central to global culture, current environmentalist thought, and the future of humankind. The passion for reading starts young as you beg your mom or dad to buy that one or that one, oh, and the one over there! And every time you go to the library it feels like Christmas. That passion will more often than not grow into lifelong readership, one that takes you on thousands of journeys and provides quite the insight into humanity and knowledge. The Raven and the Lark by Barbara L. Estrin, an insight into the uses and implications of foundling plots in the English Renaissance; The Skeleton in the Wardrobe by David Holbrook, a critique on C.S. Lewis’s unconscious; and The Garden with Seven Gates by Concha Castroviejo, a collection of 15 stories featuring children protagonists. The Raven and the Lark is the first book to survey the multiple uses of foundling plots and their implications for the English Renaissance. Describing why the period produced so many stories about children without a childhood and how the plots appeal to so many Renaissance writers, Barbara L. Estrin opens this study with three chapters that discuss classical, biblical, and contemporary sources. She then analyzes works by Malory, Spenser, Sidney and Shakespeare. As a literary formula the theme offers several possible worlds–in the lost interlude an occasion to affirm the mimetic family and praise art; in the necessary finding an opportunity to rejoice in the dynastic future and praise nature. The Raven and the Lark isolates the foundling theme in the major literature of the Renaissance and defines how writers used it both as a frame for narrative direction and a vehicle for poetic exploration. The “Narnia” stories of C.S. Lewis are widely popular and are believed by many to be renderings of important Christian truths. In church magazines, one may find bishops urging parents to introduce their children to Aslan and the allegorical mythology of Narnia. When David Holbrook began to read the Narnia books to his children, however, he came to feel that there was something wrong with them. He set out to justify this feeling, prompted by learning that some people won’t give them to children, including a psychotherapist who said they were “full of hate.” Turning from psychoanalytical insight to symbolism, he was puzzled by many questions: What is the significance of the White Witch who blights the land? And how is it that the solutions to all problems turn out to be aggressive ones? It is possible, Holbrook contends, to see in the topography and drama of the Narnia books a very different meaning from that which is commonly suggested. The Skeleton in the Wardrobe shows the stories to be enactments of a private mythology of Lewis’s unconscious. Lewis believed quite literally that the world hung between conflicting demons and angels, and he urges his reader to give assent to these realities, or perish. But, Holbrook asks, is this any less dangerous than fundamentalism, and does it not lead to strangely irrational conclusions? Holbrook shows convincingly that there are serious doubts about the “message” of the Narnia books, despite the didactic intentions and the conscious benignity. This collection of fourteen stories and one mini-drama features children protagonists, talking birds, and extraordinary occurrences. Like the tales of Charles Perrault and the brothers Grimm, they speak to fantasies and fears that are our constant companions in life, which means that although they are peopled with children protagonists, they are not for children alone. The introduction provides background on Concha Castroviejo and considers her production of juvenile literature in mid-twentieth-century Spain and in relation to authors like Elizabeth Mulder and María Luisa Gefaell; it then takes up themes in the book and discusses them.